Elinor’s risqué novel Three Weeks, published in 1907, described the romantic escapades of a young English nobleman. Banished to Switzerland, of all places, the lonely young milord meets a fascinating woman of older years; a mysterious Balkan princess in her early thirties with ‘eyes slumberous and inscrutable’ a ‘mouth straight and chiseled, and red, red, red’ and referred to throughout as ‘The Lady.’ The Lady initiates the young milord into the delights of carnal love and the two spend three intoxicating weeks together romping around on a tiger skin. By today’s standards it is all pretty tame stuff; there are far more pages devoted to The Lady’s declarations of affection for the young man coupled with puzzling requests and an ever-changing set of rules as she plays a cat and mouse game with a young man desperate to be ‘One’ with her. Mercilessly panned by critics as ‘immature rubbish for morons,’ or more simply put: ‘Squalid!’ Three Weeks flew off bookshop shelves and kicked up a tremendous rumpus among the moral and Anglican members of Edwardian England. Edward VII would not allow the book to be mentioned in his presence and boys at Eton were beaten if they were found reading it after lights out. Elinor’s career as a successful novelist was already established, but with Three Weeks she became a celebrity. In earlier and more innocent days the young Elinor Sutherland had always wanted to be a writer – a poetic writer. She was still very young when she married the extraordinarily handsome Clayton Louis Glyn – his dark brown hair had been blown off in a gas explosion at his prep school and his now thick silver hair reminded Elinor of the powdered wigs of the 18th century. It was all ‘too romantic for words’ and Elinor married Clayton after a brief but ‘intoxicating’ courtship. During a honeymoon that was ‘to swoon for’, Clayton hired the Brighton swimming baths so he could watch the superb naked form of his wife as she swam up and down like a mermaid with her hip length red hair streaming behind her in the water. They spent the idyllic first years of their marriage squandering what little money Clayton had, or pretended to have, and ended up horribly in debt. The marriage began to fall apart as Clayton succumbed to his more desperate eccentricities, one of which involved sitting up all night in anticipation of eating a pear at the precise moment it became ripe. Sinking deeper into debt Clayton transferred his obsession from ripening pears to brandy and as the bank refused to extend further loans, borrowed money from friends; running through funds at an alarming rate. It was at this point that Elinor started to write novels. They were all a tremendous success with a large and loyal readership and earned her nice, fat royalties. But however quickly Elinor churned out best sellers she could not keep up with her spendthrift husband. 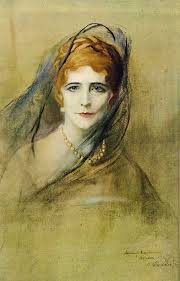 Trapped in an unhappy marriage, and never one for fidelity (Three Weeks was apparently based on an affair she had had with a young aristocrat 16 years her junior) it was about this time that Elinor embarked on a tumultuous affair with Lord Curzon, the former Viceroy of India. Among many interests Curzon was a member of the Souls; a group of young society pseudo-intellectuals with a taste for sophisticated high jinks and chancy lawn games when they met up at the end of the week at country house parties. 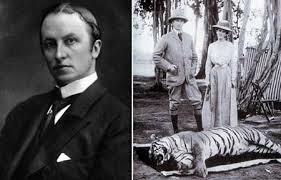 At Waddesdon, Mentmore, Halton and Tring, they drove around in gilded carriages pulled by zebras; spent afternoons on the river scantily dressed in leopard skins and tinsel crowns, reading poetry out loud; or played lawn tennis in the buff. One young Soul, Diana Manners, arranged for two piglets to be taken aloft in an aero plane, to prove that indeed pigs could fly. The self-adoring and deeply affected Souls embraced Lord Curzon as one of them, but heartily disliked and excluded poor Elinor. To her embarrassment Elinor was not invited to her lover’s house at Hackwood when Diana Manners and her soulful friends were there. She was invited after they left. She was not included in Curzon’s house parties for other important peers from the House of Lords either. Head over heels in love with Curzon, who she called her ‘universe’, it must have been wretchedly painful to be so disregarded by the man she loved so constantly. Meanwhile Clayton continued to burn through the money she earned and borrow from friends. And then Elinor learned to her horror that Curzon had made a loan to Clayton. Frantic that Clayton’s inevitable non-payment would end her affair with the man she so revered, she decided she must pay off Clayton’s debt to Curzon before it went bad. In order to scrape together £1,000 (a sizeable sum at the time) she accepted an offer from the Daily Express to write 90,000 words that would be serialized by the newspaper. The result was a novel called The Reason Why, and was the sort of thing much loved by her many fans; a fast-paced, page-turner with all of Elinor’s hallmark elements: a handsome hero of aristocratic lineage, a beautiful pagan heroine with a proud and savage soul, a banker with a heart of gold, and a talented writer dying of consumption in a garret. It made Elinor writhe with shame every time she read it and she must have felt very far from ever producing a work of worthy literature. Predictably, The Reason Why was a hit; Elinor paid off her husband’s debt to Curzon and kept her unkind lover. Still desperate for Curzon’s approval and striving for literary praise for a ‘serious book of worth’ Elinor now appears to have lost her head a bit. She embarked on her ‘serious work’ of fiction: Halcyone. Written to impress, it was heavily larded with authentic quotations kindly supplied by a professor of ancient Greek. Halcyone’s focal character who Elinor described as a selfish, unkind, egotistical and ruthless misogynist who believed that only men had souls was remarkably like that of Lord Curzon, but somehow poor Elinor did not see this. Or perhaps deep down in her sub-conscious she rescued herself from Curzon’s clear disregard of her, by ending an affair with a man that however much she loved him, would only treat her badly and cause her pain. 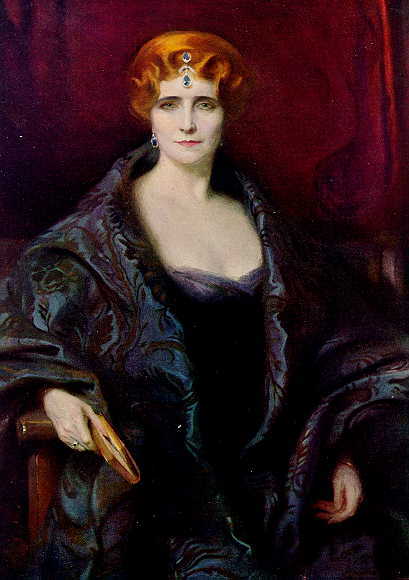 She gave Curzon her manuscript, which he read. He made a few grammatical corrections and returned it to his ex-mistress with no other comments.